Upgrade your old haggard book bag to the Quiksilver Graduate skateboard backpack. This all-purpose backpack is padded for your comfort. It has adjustable straps and a pocket specifically designed to protect and carry your cell phone. The front of this pack has a subtle and stylish Quiksilber logo. Inside this backpack is insulated and contains organizer pockets. The easily accessible main compartment has zippers on both its sides and top. This backpack is 18″ high, 16″ wide and 11″ deep. Grab yourself the Graduate skate backpack now! Tags: Black, Cellphone Holder, Quiksilver. Vans has created a backpack that keeps protects your gear and keeps you organized. What else do you need in a skate backpack? Available in both the green striped and black plaid styles shown above and made from 100% polyester. This bag measures 20″ x 15″ x 6″. 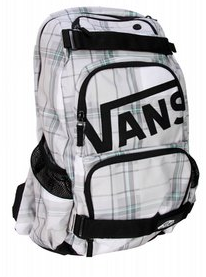 Tags: Black, Cellphone Holder, Green, Laptop Carrier, Plaid, Skate Holder Straps, Striped, Sunglasses Pocket, Vans. 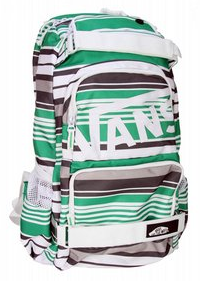 The Nike SB Eugene Skateboard is an amazingly comfortable backpack made from 100% nylon. It has multiple large compartments for your to organize and store your gear. There is also a specific cellphone/mp3 pocket that is padded to keep your technology safe. Inside is a padded laptop sleeve that fits most laptops. This backpack is all around styling, spacious and comfortable. It is available in 2-toned blue and white, or full red. Tags: Blue, Cellphone Holder, MP3 Holder, Nike SB, Red, White. 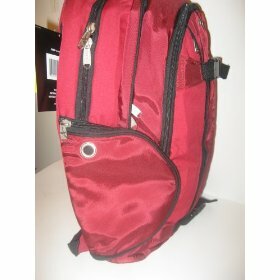 This Athletech skateboard backpack is a dark red with black pipe trim. It has a specially designed pocket to hold your cellphone or mp3 player. The dimensions of this pack are approx 17x21x6.5 inches. Tags: Athletech, Cellphone Holder, MP3 Holder, Red.